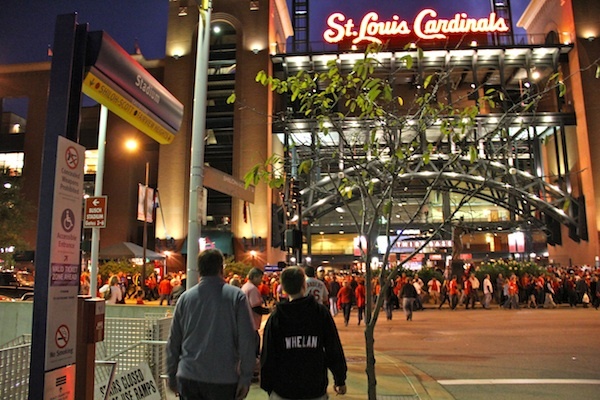 Extra MetroLink Service for World Series Games…Go Cards! St. Louis Cardinals fans and Metro Transit could not be more excited that their beloved Redbirds are in the World Series. Metro is ready to transport Cardinal Nation and visitors who will flood Downtown St. Louis for Games 1 and 2. Metro will operate extra Eastbound and Westbound trains after the games Wednesday night and Thursday night to help the crowds get home, and Metro staff will be at the Stadium and nearby stations to monitor crowds, and assist with customer boarding. Let the games begin! Go Cardinals! Hi, we’re coming to Game #2 of the World Series on Thursday. We’ll be staying at the Drury Inn in Chesterfield, along I64. Would it be possible and easy for us to take MetroLink from there to Busch Stadium, to and from the game? How would we do that? Thanks! Note: Hanley Industrial Drive is now called Musick Memorial Drive. A couple of connections can be made from Chesterfield to a MetroLink Station w/o driving all the way to the Brentwood Station. 2). Catch the #91 from the Chesterfield Mall Parking Lot to the Delmar Loop station. That should save some on the gas. Will Metro provide extra downtown bus service for the World Series? This is a great opportunity for Metro to showcase itself with their bus service and make a good impression of our city. Also, how about the possibility of Metro running some sort of shuttle bus service along the Delmar Blvd. corridor during the series, to connect attractions along that route to the downtown area for out-of-towners? Mike, unfortunately their is no additional bus service planned for the World Series. If we were asked to do so, I’m sure we would. Both additional bus service downtown and a shuttle bus need community partners and collaborations to make it work. Courtney, one correction to your directions: They need to make a right on to Musick Memorial Drive, not Hanley Industrial Court. They’re two different streets on either side of the tracks, and they have to drive over the tracks to get to the garage, assuming they exit at Brentwood and go east on Eager. I don’t want them getting towed if they park in the Dierbergs lot by accident. Thanks Jon. I clarified that as well in my comment. I’m not sure why the Google Map directions have the incorrect name, but I’ll see if I can get it fixed. Hi, I am visiting family in Chesterfield and am wondering the easiest way to get to game #2. I am told Clayton may be the closest station. Is this correct? And if so, is there ample parking at the station, and what would a round-trip ticket cost to the stadium station? Jon G., I would suggest taking the Brentwood Station; please see my previous comment. The reason being: the Clayton stop has pay parking, while the Brentwood Station has free parking. Also, the Brentwood Station is immediately off Interstate 64, versus turning off from 170 into the Clayton Business District. If you still need help navigating, please call me at (314) 982-1436 and I can talk you through the directions. I think previous commenter Mike would agree this is the simplest and easiest way for your family to get to the game. Thanks for taking transit! I had the same thought as you did – particularly as the 258 stops right at the mall. Sadly, the buses don’t run late enough, and with no extra bus service laid on for the Fall Classic you’d just get stuck. Its all part of the “Metrolink” vs “Metrobus” way of thinking – the two are rarely mentioned in the same breath. Further, the bus system here isn’t designed as a transit system – its designed to move commuters. To take up your point about Metro showcasing itself – you know as well as I do, that isnt how Metro works. Metro doesn’t advertise itself unless it has something to do with the 99 or the 3. For all its talk and discussion about trying to get more riders onto its buses, Metro really doesn’t seem to want the extra ridership – or perhaps doesnt seem to want to do anything to attract (and KEEP) the extra ridership. Metro doesn’t do itself any favors by 1) not talking about its routing that isnt painted, and 2) running buses on a “commuter” schedule instead of actually trying to provide transit. If the system were actually integrated, you might not need the extra buses – and even if you did, the additions would be easy to implement and seamless. Please dont get me wrong – I think it is great that Metro is adding extra trains, and I am glad they are doing so. But Mr. Offenburger’s question (and our eventual answers) highlight one of my biggest frustrations with the system we have. You can’t actually use it to get around outside of specific hours, and services outside of the core area of the city are lacking (in some cases, severely). A little bit of advertising, some extended operating hours, and working with local businesses such as hotels to educate both local hotel staff and guests on how to use the system as a whole would go a long way to grow ridership and making out city easier to get around. I would recommend you use the Brentwood Station garage as Courtney suggests if you can. Parking is free, the garage is big, and if you are coming from Chesterfield, you are right on I-64/40 so you don’t have to worry about navigating to the Clayton garage. Under the circumstances that both of you pointed out, Jon would be better off using Brentwood. My comments were mainly bent on trying to encourage the usage of public transit its full spectrum, and not just focusing on MetroLink as the only player in town. After all, I thought Metro’s goal was to attract more bus riders. But as RT suggest, the right kind of bus service has to be in place. For my part, I do understand – and like Mike, I am actually trying to advocate using the system (ironically, to Metro itself and not a rider). Like I mentioned earlier, I had the same thoughts Mike had until I looked at schedules, which is when I got frustrated. Metro rightfully added extra service on Metrolink for the World Series. How hard would it have been to extend bus services a few extra hours? Metro has said repeatedly that they would like more people to ride the buses. Fair enough, but you can’t ride if the buses don’t run when you need them to. You also need to know buses connect you to the train (*cough* advertising *cough*). In this particular case, you didn’t need “special” service, you just needed a few extra runs of the 258. For Game 6 tonight, we have thought about using the MetroLink rail. We are coming from Indianapolis and wondered the best possible station to use? We will come in from I-70 to I-55. Thanks! Parking at East Riverfront is free, and is adjacent to the Casino Queen parking lot. If you are staying at a hotel, I can help you find a station nearby as well. Once you get to the station, take MetroLink west bound (either blue or red line trains) to Stadium Station. Follow the sea of red! Be sure to buy round trip tickets and validate one per trip, it will save time on the return trip. Let me know if you have anymore questions! Our family is visiting for the World Series. Is there a mall with a movie theater on the metrolink train line? Yes, at the Richmond Heights Station on the Blue Line, the Galleria Mall is a two-block west walk from the station and has a movie theater. Also, for art house films, the Chase Park Plaza Theater is a five block walk north from the Central West End Station, a lovely walk down Euclid Avenue with lots of cafes and bars. Hope this helps, and have a great time visiting St. Louis! How do I get to the Richmond Heights Station from the airport? Take the Red Line east to Forest Park-DeBaliviere, and transfer to a westbound Blue Line train heading towards Shrewsbury. It’s a 10-min ride from there. Are the extra train times after GAME 7 published anywhere? Coming from the Clayton station. Concerned about the last train time from the stadium back out west. Lori and R, we have confirmation that MetroLink will extend service 2 hours after the end of the game, regardless of game ending time. Hope this helps!